BUILD IN 1987 RECENTLY RENOVATED 2006. ALL 51 ROOMS ARE FULLY EQUIPPED WITH A COMFORTABLE BATHROOM TELEVISION WITH INTERNAL MOVIE CIRCUIT TELEPHONE MINIBAR WIRELESS INTERNET WORKDESK... 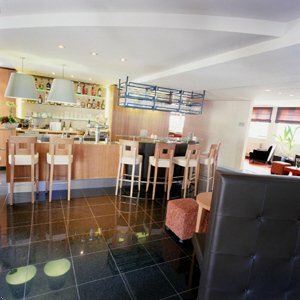 THE HOTEL OFFERS A TRENDY LOUNGEBAR SAUNA RELAXROOM... PRIVATE PARKING FREE OF CHARGE. STANDARD ROOM - DOUBL+TWIN NEW MATRASSE MODERN ROOM WITH A COMFORTABLE BATHROOM WITH BATH MINIBAR TELEVISION MOVIE CHANNELS WIRELESS INTERNET TELEPHONE. First take e40 direction Luik/Liege. Change onto e314 direction Hasselt/Genk. Take exit 31 Genk and turn left at the second traffic lights. After about 300 meters you will see the railway station on the left and Hampshire Inn - Ecu Genk on the right. FIRST TAKE E40 DIRECTION LUIK LIEGE. CHANGE ONTO E314 DIRECTION HASSELT GENK. TAKE EXIT 31 GENK AND TURN LEFT AT THE SECOND TRAFFIC LIGHTS. AFTER ABOUT 300 METRES YOU WILL SEE THE RAILWAY STATION ON THE LEFT AND HAMPSHIRE INN - ECU GENK ON THE RIGHT. Offering International Cuisine. Location in the Centre Of Genk Open Wednesday - Sunday 1800 - 2200 for dinner. Offering International Cuisine Location in the Centre of Genk 0.5 kilometers north Open Sunday - Saturday 0900 - 2100 for breakfast, lunch, and dinner. Offering International Cuisine. Location in the City of Genk 0.1 kilometers west Open Thursday - Monday 1800 - 2200 for dinner. Offering International Cuisine Location in the City of Genk 0.1 kilometers west Open Wednesday - Monday 1800 - 2300 for dinner. Maximum theatre style capacity - 25 Maximum classroom style capacity - 14 Maximum u shaped style capacity - 13 Maximum boardroom style capacity - 16 The room does have windows with natural daylight that can be effectively blacked out.